Steve Flaherty Wildlife Photography Blog: Gigrin Farm, Gateway Hide. As I said in my last blog. I find the Gateway Hide very good for getting images of the Kites in the air. What I really like about his hide is that there are a maximum of 5 people allowed in this hide so you have plenty of room. Another good feature is that you are able to use a tripod and that you have plenty of vision of the birds as well. 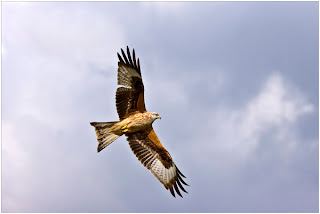 images of Red Kites is easy. I would like to tell you that it isn't. The thing that is challenging is to isolate the birds from the others as there can between 200 and 400 birds there at any one time. The trick is to follow one bird and then photograph it when you have it isolated from the others. This on times could mean you following a bird for a couple of minutes. Another point to note is that don't keep pressing the shutter release all the time. Think about what you are photographing and you will get better results in the long run. Whilst taking these photographs as well, keep checking the back of your camera, looking at the histogram to see if you are getting any of the highlights burnt out. The way I overcome this in my photography is to underexpose my shots by 1/3 of a stop to prevent this. I would like to thanks Andy Rouse for that tip. Another good investment I made recently and I would recommend them to anyone that has a big lens is a Wimberley Gimbal Head. I managed to find a bargain on Ebay (they are not on there very often). This has also improved my photography as it allowed you to track birds easier, the main advantage of it as well is that you mount it on a tripod and this gives you a steadier platform. Therefore taking the weight of the camera and lens off me. Best investment that I have ever.